How is everyone spending their Memorial Day? I'm still watching the new episodes of Arrested Development on Netflix. 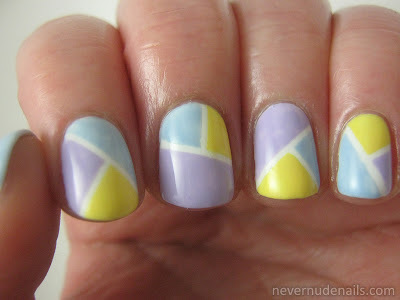 I attempted to do Arrested Development themed nails for Sunday but it was a huge disaster (I've made a huge mistake!). I did two nails and scrapped the whole thing because it was so terrible. I'm left with a simple swatch for today. Orly's High on Hope. High on Hope is part of the Hope and Freedom Fest collection along with Elation Generation. 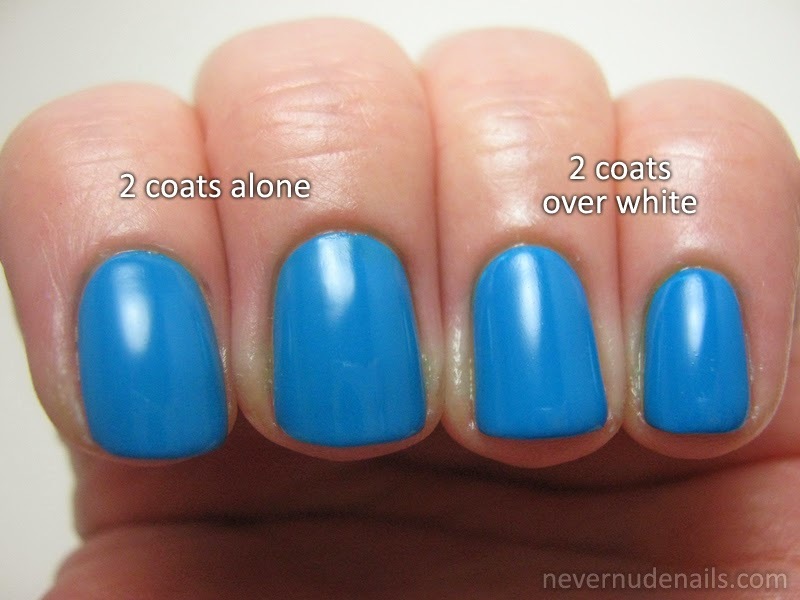 This is two coats of High on Hope with NYC Grand Central Station acting as a top coat. For some reason, it looks pretty thin on the tips of my ring and pinky nails. It's just in the pictures though. Weird. It's still a pretty polish! Here you can see the colorful shimmer! 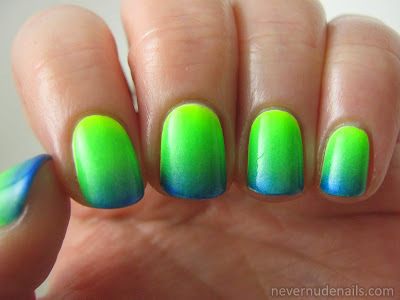 What happens when you mash up two of this summer’s hottest nail trends: neons and matte glitters? 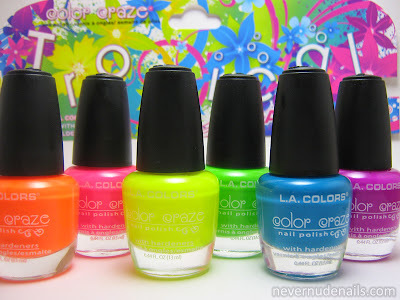 You get an energizing burst of color from the new Salon Perfect® Neon Collision nail polish collection! Salon Perfect® floats neon matte fine glitter in a clear base to create this “can’t-not-look” collection of six eye-catching shades that offer complete coverage in 2-3 coats. 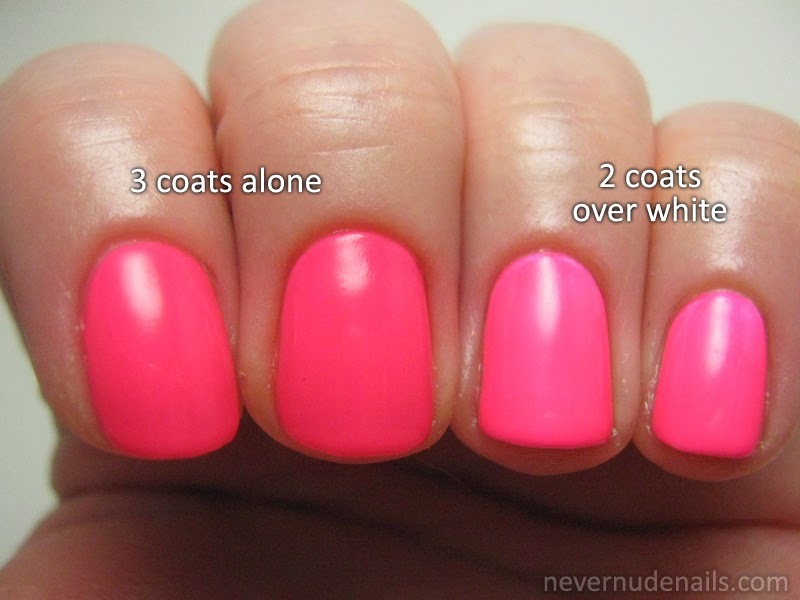 Or give nails a blast of nail art by using any Salon Perfect® Neon Collision shade as a one-coat layering polish, or blend two shades to create an easy ombré look. Salon Perfect® Neon Collision will launch in June exclusively at Walmart stores nationwide as part of a limited edition promotional display. Individual shades will retail for $3.98. From lashes and brow products to nail color and beauty tools, Salon Perfect® has the products needed to get effortlessly gorgeous looks at affordable prices. View the complete Salon Perfect® collection at www.salonperfect.com. These look pretty interesting! I hope I can get my hands on some! While I was at Family Dollar picking up some lotion, I came across a set of 6 polishes from LA Colors called "Tropical" for $5. I have to thank my boyfriend for this because I wouldn't have noticed it at all if he hadn't pointed it out. I have no idea if these are new or old, just new to me! 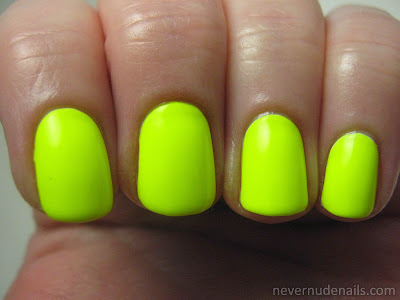 None of the polishes have names but they are super fun neons! All photos below show each color with white underwear on my ring and pinky fingers but alone on my index and middle fingers unless otherwise stated. They all have NYC Grand Central Station as a top coat. This one absolutely needs white underwear. If you apply it without (not pictured), it just looks like really nasty stained nails. Still a few streaks left on the underwear-less nails after three coats. This blue is very pigmented. It's almost a one coater. The white underwear was totally unnecessary! There was some very slight staining with this one. The first coat of this one tricks you. It comes out so incredibly streaky that you think it's hopeless. The second coat fixes most of it and it's perfect by the third coat. I'm glad I picked this set up. I like that they look good with or without white underwear with the obvious exception of the highlighter one. I think I actually prefer the purple one without underwear. They were all easy to work with. $5 for 6 fun polishes? Awesome! Have you seen or own this set? I recently picked up two of the new MegaPixel FX polishes from Orly: Black Pixel and Silver Pixel. I picked these out because of the "buy any 2 Orly's, get a free full size Argan Oil Cuticle Drops" deal going on at Sally Beauty Supply. Plus, I really wanted a black textured polish! This is two thin coats of Black Pixel, no top coat. Of the textured polishes I've tried so far, this is one of the smoothest. The dry time was good! Application wasn't nearly as effortless as with the JulieG Frosted Gumdrops collection but not bad at all. I decided to spruce it up a bit and add some accents in Orly Silver Pixel on my ring finger and thumb. Hello! 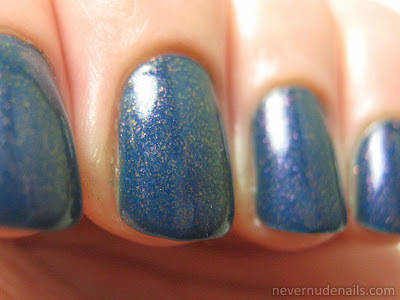 I have Orly Fowl Play to show you today. This is two coats of Orly Fowl Play with NYC Grand Central Station acting as a top coat. I think it's gorgeous. Look at the colors of flakes! It's pretty much mandatory to show flakie polishes with matte top coat, right? 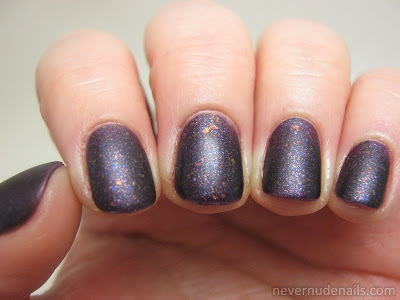 Fowl Play is a really really close dupe to OPI Merry Midnight. 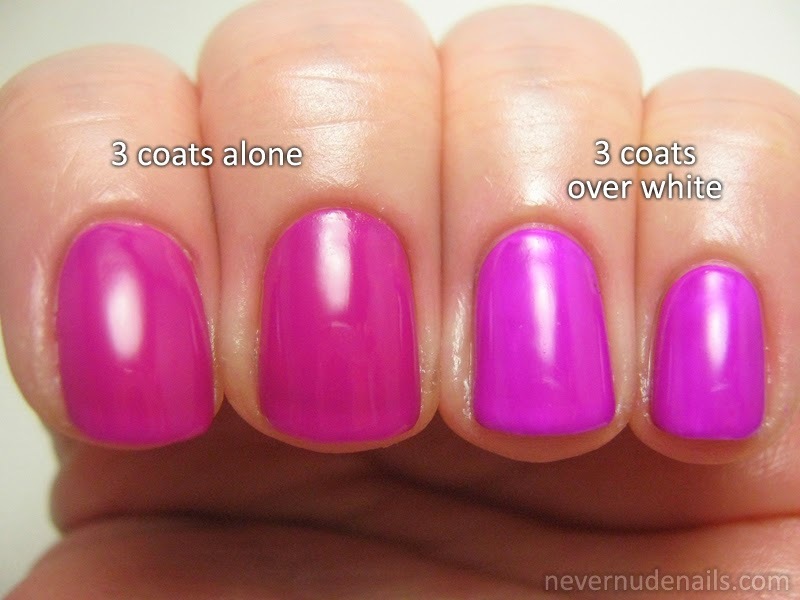 Fowl Play requires only two coats though as opposed to Merry Midnight's three. Merry Midnight is also a smidge more of a juicier purple. Here's a blast from my past! My boyfriend found my old backpack that I owned from high school. I'm about to turn 35 in July so high school was a long time ago. 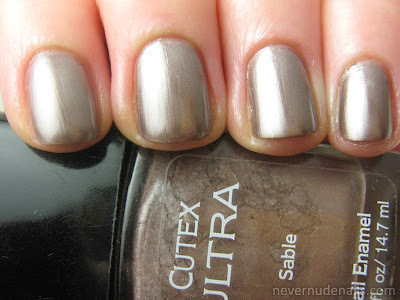 Inside it was a bottle of nail polish: Cutex Ultra Sable. I'm guessing this is from the very late '90s. See how nasty the side of the bottle is? I'm surprised I got enough polish out of this to swatch one hand. I had to add a ton of polish thinner to it in order to use. 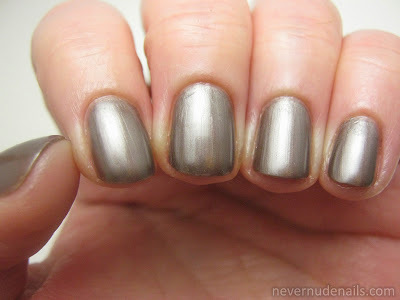 It has a metallic finish so it's rather brushstroke-y and shows every little imperfection. Application was ROUGH but I'm sure that's because of its age. I had to top it with Seche Vite because I don't think it would have dried on its own so it looks even more wonky with weird shrunken bits. After I swatched my one hand, I showed it to my boyfriend and he said "I like it!" I was probably wearing it when we met. Does Cutex even make nail polish anymore?! After a disappointing experience with Chasing The Sun ombre kit, I was apprehensive about how Wave Runner would turn out. But it turned out great! It's so fun and FUNKY! The colors blended relatively well together. Please excuse the nick on my ring finger. I don't know what happened there. 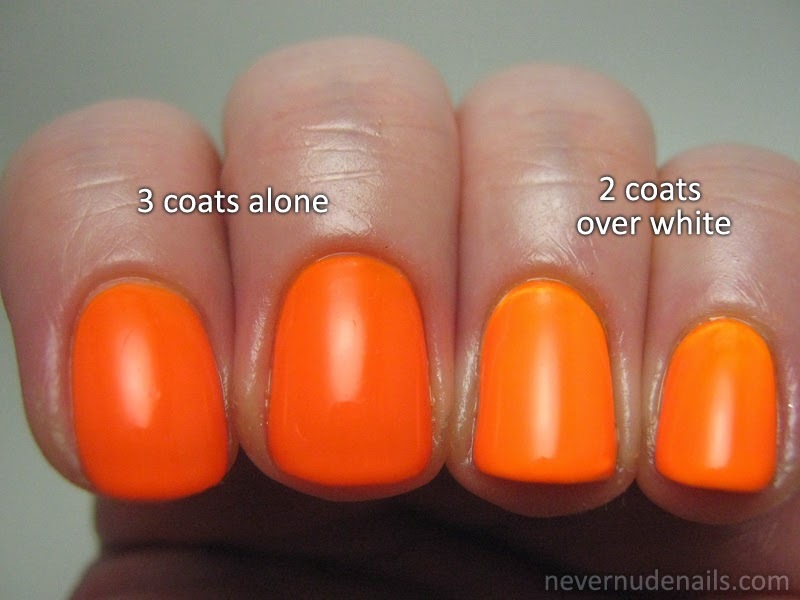 Since Celtic Sun and I'm With the Lifeguard are neon, they dry matte. Celtic Sun is actually SUPER neon, wow. Frostbite is shimmery so there's a contrast of finishes. They look better together after topcoating. Born Pretty Store Giveaway Winner! 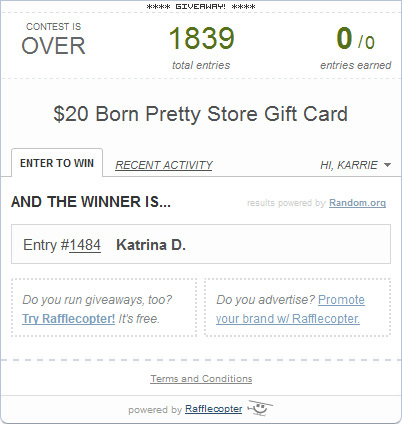 Congrats to Katrina D for winning the $20 Born Pretty Store (which just got an awesome makeover) giveaway! She has replied to the email so the giveaway is officially over! I used to be a nail biter before turning to the polish world! Good for you! I've never been a nail biter but I can see how polishing them up all pretty would deter from biting! Oh no. I'm sorry for contributing. I am so excited for Arrested Development to be back! Two-ish weeks! Born Pretty Store is pretty awesome. It's like an online candy store for nail art addicts. I have six rats who are like my kids, I take care of them and love them with all of my heart. One of them is old and needs extra food, so I give him baby food twice a day. He loves it! How sweet! I bet they're adorable. Thanks for entering and leaving comments! Don't those colors look AWESOME? Unfortunately, they do not translate well into a gradient. At least, not for me! Sun Worshiper and Pool Party make an awesome gradient but Flying Dragon just wasn't having it. At all. It has a very weird texture and I think that has a lot to do with the failure of this manicure. This was actually my second attempt at doing this gradient but it turned out pretty much like the first one. I even reloaded Flying Dragon onto my sponge for each finger instead of once for each hand and it didn't make a difference. Boo. I might try this with a different purple. The cool part about this is that when I catch a glimpse of my fingers, it looks like I've been eating some radioactive Cheetos or something. I hope Wave Runner turns out better! 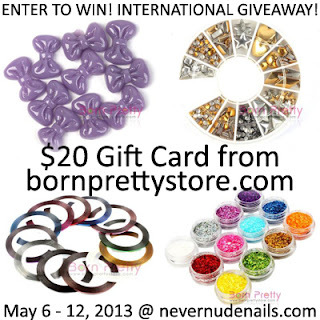 I'm waiting to hear from the winner of the $20 Born Pretty Store giveaway. If your name is Katrina, check your email! 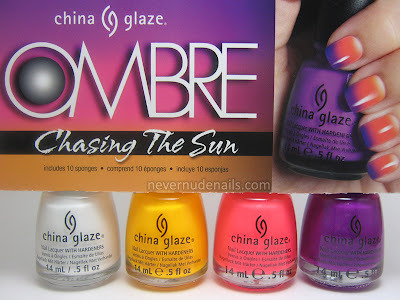 Once again, I was stalking the "new manicure and pedicure products" on sallybeautysupply.com and saw there are two new China Glaze Ombre kits! I ordered them immediately, ha! 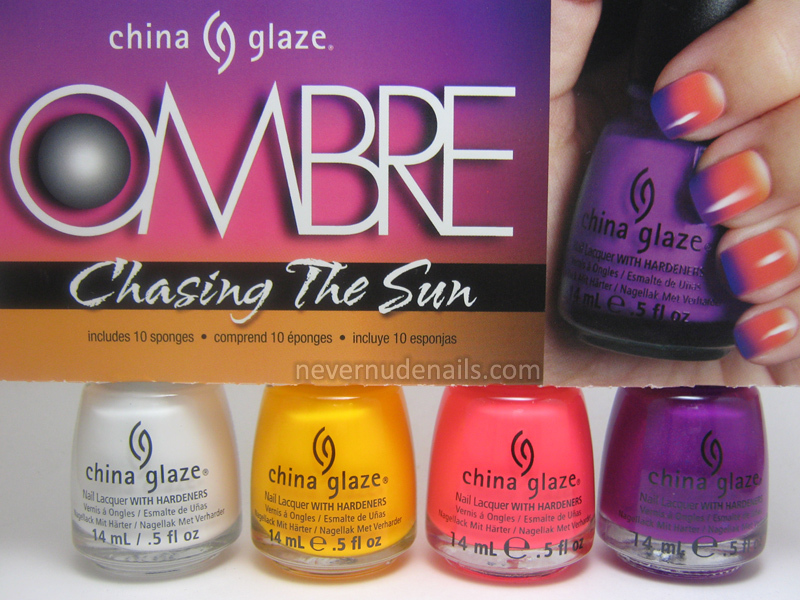 Chasing The Sun includes White on White, Sun Worshiper, Pool Party, and Flying Dragon. Wave Runner includes White on White, Celtic Sun, I'm With the Lifeguard, and Frostbite. Just like the previous kits, they also have 10 sponges inside and instructions on the back. I much prefer to use makeup wedges to do gradients over the sponges that are included though. But, ugh, I love these kits! Keep them coming! 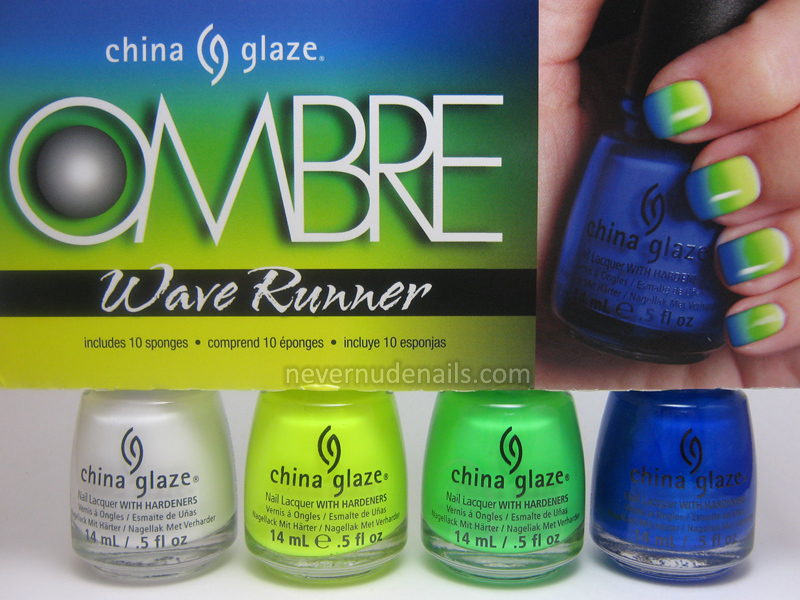 They have a combined listing on the Sally Beauty Supply website now: China Glaze 4 Piece Ombre Set. Wait Teal You See is suspiciously gone. I don't know what happened to that one. I was inspired by a tennis outfit that Blanche Devereaux wore in an episode of Golden Girls. I couldn't find a picture of it so I went by memory and probably got it all wrong. I started with a base of White on White (China Glaze) and put down some striping tape. I then painted each block with Banana (Sally Girl), Coconut (Sally Girl), and I Lilac You (Rimmel London) and removed the striping tape. I picked up the two Sally Girl polishes, Banana and Coconut, on a whim. I was at Sally Beauty Supply and they were there on the counter and I couldn't resist. The display was called "Smell the Colors" but I didn't notice that they were scented polishes until I used them. How daft of me! They smell quite nice. I wish I would have grabbed the rest of the colors. 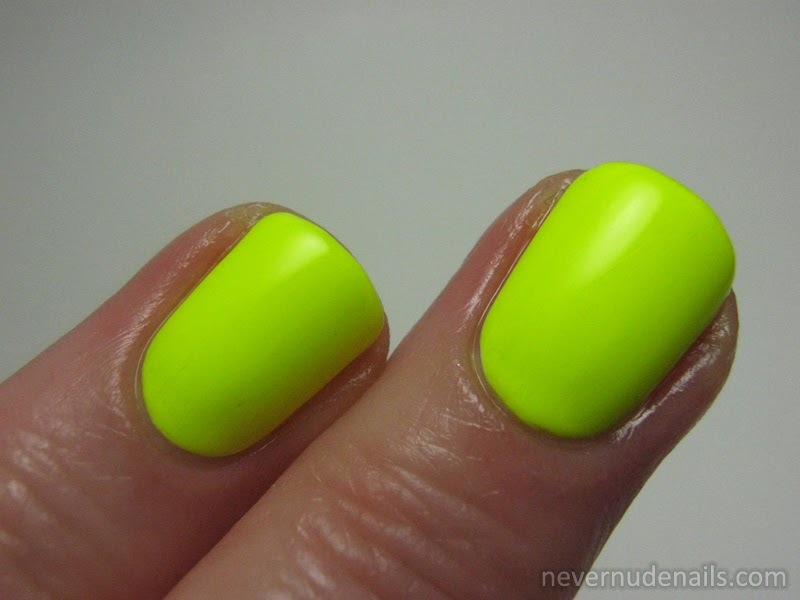 I just realized that I did a tennis outfit inspired manicure right after swatching In the Rough (China Glaze) which my boyfriend said reminded him of a tennis ball. Tennis week, anyone? Kidding! 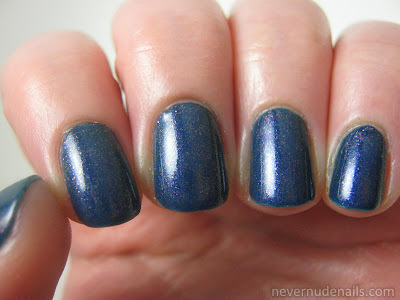 While out recently, I picked up one of the China Glaze Texture polishes: In the Rough. I'm a fan of the color and final look but I wasn't a fan of the application. Did any of you out there ever watch You Can't Do That on Television? I loved that show as a child. I didn't have cable while living with my dad (we lived up on a hill and nobody wanted to run cable up to it) but I was able to watch it when I visited my mom. I taped one episode of it and took it home to my dad's and watched it over and over, lol. Anyway! In the Rough really reminds me of getting slimed! My boyfriend says it looks like a tennis ball to him. Either way, I like it! Application of In the Rough wasn't as pleasant as JulieG Frosted Gumdrops. It tended to pool in places and I had to do a lot of cleanup. Cleaning it up wasn't easy either. Dry time was slower than with Frosted Gumdrops. $20 Born Pretty Store Giveaway! I recently won a giveaway held by Born Pretty Store on twitter and I want to share the love! You can win a $20 gift card (purchased by me) to spend on anything you want at bornprettystore.com! The giveaway is open worldwide! Winner will have 48 hours to respond to the winning email. If no response, a new winner will be chosen. You have until May 12, 2013 to enter. It's time to show you the last prize I won from BornPrettyStore.com's twitter giveaway! 4pcs Nail Water Decals Stickers Cute Chinese Style Opera Facebook Cartoon Bowknot Patterns. 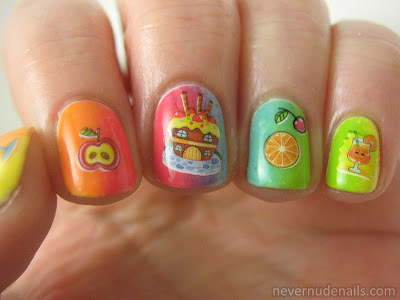 I chose the food themed one (B0P068-71) because I liked the cute style and colors. I forgot to take a picture of the sheet before I started cutting it up, sorry! 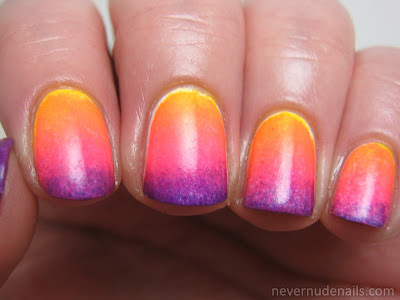 I started with a 5-color gradient with 2 colors per nail. The colors I used were Daisy (LA Colors), Sunny Side Up (Wet n Wild), Louvre This Pink (FingerPaints), Swizzle Stix (Barielle) and Wild Thing (Pure Ice). I applied the water decals on top. This manicure screams summer to me! These water decals were so easy to use! You just cut out the part you want to use and place it in water for 10 to 20 seconds. I used a small bowl to do this. After you pick it up out of the water, the decal part slides right off the paper backing and you can position it on your nail. 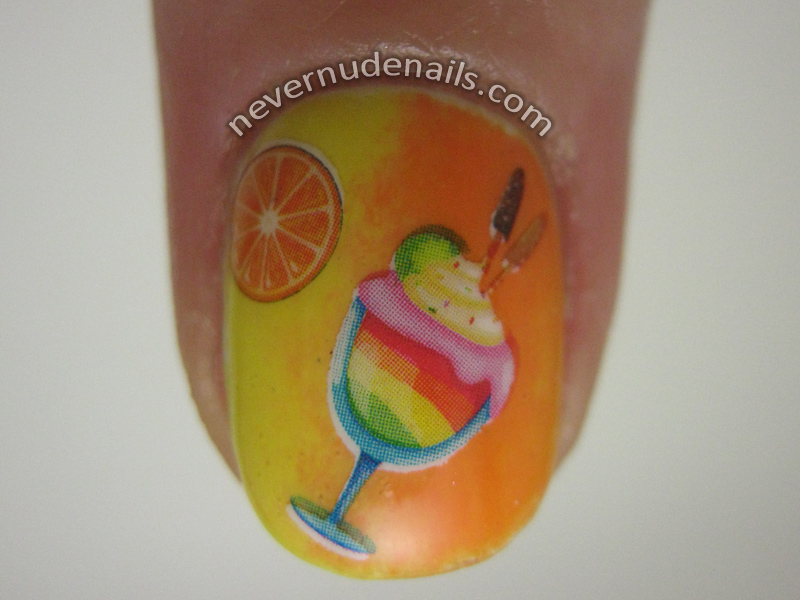 You have ample amount of time to slide the decal around on your nail to get it just right. When you're satisfied with where it is, you use a paper towel to sop up the leftover water. Top coat it and you're done! So simple and easy! I had never used water decals before this and I can say that I would definitely do it again! You can find these water decals here: 4pcs Nail Water Decals Stickers Cute Chinese Style Opera Facebook Cartoon Bowknot Patterns for $3.99 each. There are 4 different patterns so be sure to specify which one you want. 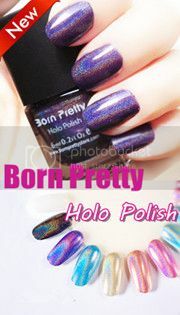 Born Pretty Store has FREE worldwide shipping! Don't forget to use code KARW10 to get 10% off your order! Now that I've swatched all the JulieG Frosted Gumdrops polishes, I thought I'd share my thoughts about the whole collection. It was my first experience with textured polishes and I think it went well. I wasn't terribly turned off or anything. I don't know if it's just my imagination but my hands felt very dry while wearing these. It's probably psychological though! Removing them was much easier than I thought it would be so that's a plus. 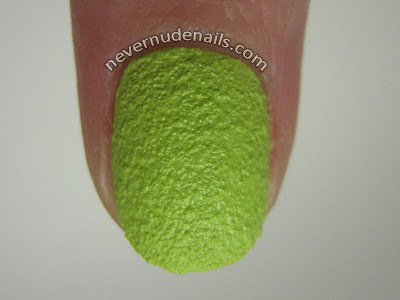 I do wonder if you can use thinner in the textured polishes if they start drying out? Has anyone had to do this yet? My favorites are Crushed Candy, Hot Cinnamon, and Sugar Rush. Do you have favorites from this collection? Have you bought any of them? Have you been able to find them in stores?